If you’re over 55, you’ll be interested to hear that our Orchard Brook show home apartment will be opening on Saturday 15th December 2018. Come and visit us to see this beautifully appointed apartment set in the heart of Long Melford village, close to village amenities and countryside walks. Our doors are open between 10am – 5pm every day. What is the Orchard Brook development? 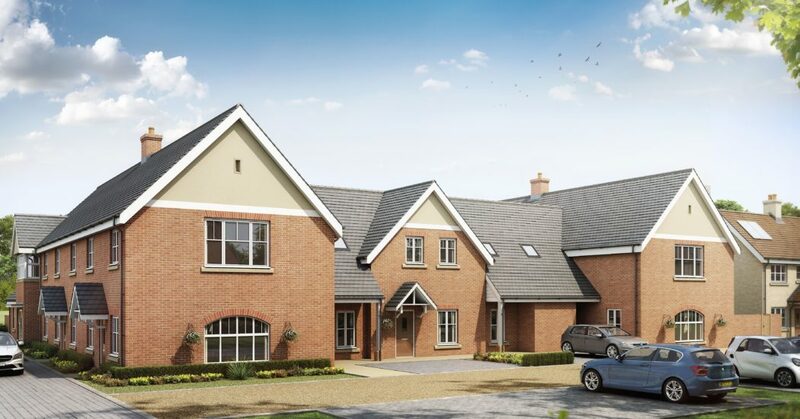 The Orchard Brook development in Long Melford is a collection of brand new, stylish one & two bedroom apartments and two bedroom cottages for the over 55s. Apartments feature private allocated parking, communal gardens, a lift to first floor and fitted kitchens with a host of appliances. If you require a mortgage you could qualify for Help to Buy. View the properties on our website here. A property at Orchard Brook could still be a useful investment for those aged under 55. Why not visit our show home apartment during the festive break – family members are welcome too! We’re open 28th – 30th December so it’s the perfect opportunity to visit our new development of apartments which have been specifically created for those that are over 55. Our doors are open between 10am – 5pm.